I gotta check out this bar! I bet the I-5 killer stopped in for a pint too! I wanna say charm your way in.....but don't. I ready this story about the owners of the Goonies house and all the abuse and harassment they've had to endure. I'm sure the "Tremont/Chalfonts" have similar problems. And their neighbors probably HATE them for allowing another round of filming thus increasing traffic and chaos on their street. How many idiots do you think stand in the middle of the street and say "what year is this?" while drivers sit in their cars waiting to pull into their own driveways, fantasizing about running over every Agent Cooper wannabe. Ironically (or maybe not) I was driving down the peninsula coming from the Victoria Ferry when I was responding to you. It wasn't until we got to the narrows that it occurred to me that we totally could have stopped into Poulsbo. Bad planning on my part. Well this is the price of the success. 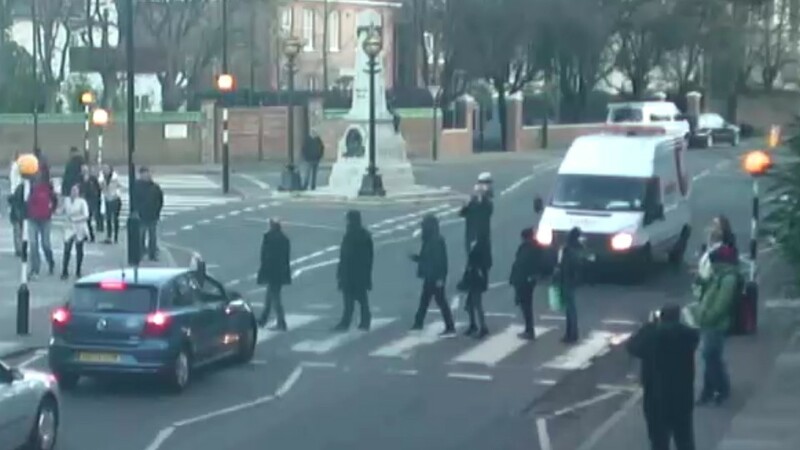 Like Abbey Road in London, with hundreds guys crossing the street every day like George, Paul, Ringo and John. And with hundreds other guys standing at the same time in the middle of this heavy trafic street with a camera to shot their buddies. Soon a live webcam in front of "the Palmer's House" in Everett. Who's success? It's not like David Lynch lives there. It's a family home on a quiet street. The current owners didn't even own the house at the time of FWWM. I say leave them be. It's not a large public intersection like Abbey Road. Hope they don't end up jaded and bitter and harassed and abused like the Goonies house owners and neighbors.